We are sold out of hay. Thank you to all of our customers! Our 1st cutting 2019 will be available in May – Mother Nature willing. Ready for some warmer weather and the snow to be gone? We sure are! This last storm not only brought a little more snow but added a 1-2 punch of freezing rain! It’s beautiful to look at but treacherous to work in. We still have premium orchard grass hay available if you need feed for your animals. The sun was out for most of the day. What better way to spend the day than sledding behind a tractor! 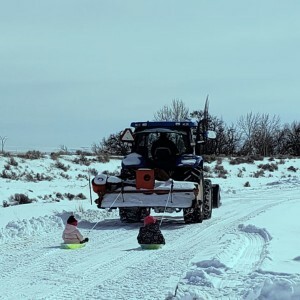 Farm kids have all the fun!